Supported by a local Friends chapter, this beautiful plantation represents the history and culture of Georgia’s rice coast. In the early 1800s, William Brailsford of Charleston carved a rice plantation from marshes along the Altamaha River. The plantation and its inhabitants were part of the genteel low country society that developed during the antebellum period. While many factors made rice cultivation increasingly difficult in the years after the Civil War, the family continued to grow rice until 1913. The enterprising siblings of the fifth generation at Hofwyl-Broadfield resolved to start a dairy rather than sell their family home. The efforts of Gratz, Miriam and Ophelia Dent led to the preservation of their family legacy. Ophelia was the last heir to the rich traditions of her ancestors, and she left the plantation to the state of Georgia in 1973. A museum features silver from the family collection and a model of Hofwyl-Broadfield during its heyday. A brief film on the plantation’s history is shown before visitors walk a short trail to the antebellum home. A guided tour allows visitors to see the home as Ophelia kept it with family heirlooms, 18th and 19th century furniture and Cantonese china. A stop on the Colonial Coast Birding Trail, this is an excellent spot to look for herons, egrets, ibis and painted buntings. A nature trail that leads back to the Visitors Center along the edge of the marsh where rice once flourished. 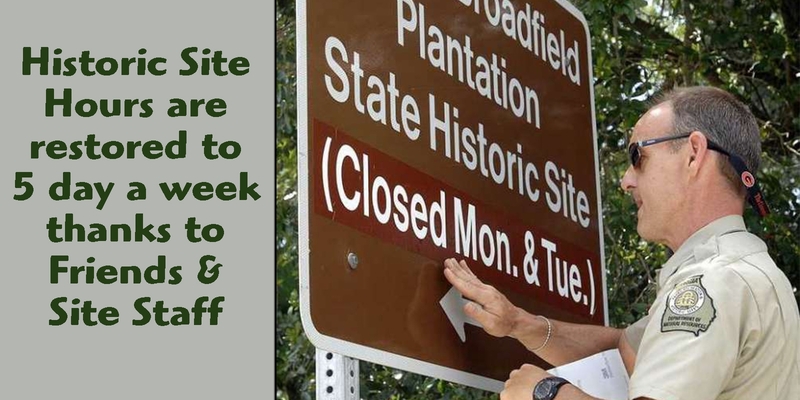 Bill Giles, manager of Hofwyl-Broadfield Plantation State Historic Site, smooths down a decal on a road sign that tells the park's schedule. The historic site had been open only Thursday through Saturday. However, thanks to Friends, this fascinating, antebellum plantation is now open five days a week. When state revenues plummeted in 2009, the state cut Hofwyl-Broadfield’s operating days to Thursday through Saturday. For a full listing of events and information about Hofwyl-Broadfield Plantation Historic Site Historic Park visit the Georgia State Parks page.